The perfect handbook for movie-lovers of all ages, helping both kids and parents choose classic and contemporary movies appropriate for the entire family. Movies are made to entertain! Movies can make you think, teach you a lesson, or just let you escape into a fantasy world for a few hours. This book serves as an interactive bucket list of films for children ages 8 and up to watch before they grow up. 101 Movies to See Before You Grow Up goes beyond mainstream films. From modern flicks to classic films, the list offers a wide selection of "must see" movies. The book is divided into categories and acts as an interactive film journal where kids can document when they see the movie, if they liked it, and how they would rate it. Each page focuses on a single movie with basic information about each film, including the director, runtime, rating, and date of release. There is also a "Film Critic" section at the bottom of each page that allows young movie buffs to write in their own opinions and observations about the movie. 101 Movies to See Before You Grow Up is the perfect handbook for movie-lovers of all ages, helping both kids and parents choose classic and contemporary movies appropriate for the entire family. "In a world of too much media and too little family time, Suzette Valle's book has great movie choices that bring families closer." - Nell Minow aka "Movie Mom"
I love this book for so many reasons. As a kid I made lists of movies I saw and movies I wanted to see including what I thought about them and why. If this book had been around I would have surely asked for it. 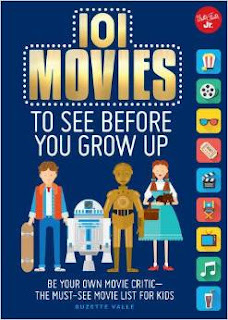 The whimsical graphics make the book very child friendly but I think any movie buff will love the idea of 101 Movies To See Before You Grow Up. Each page features a movie along with a synopsis about it plus trivia, box office results, rating, and more. There is even a section at the bottom for you to fill out what you thought about the movie, giving it a rating and adding things like when you saw it and with who. This is a wonderful journaling book that will stay with someone for years to come. This is the perfect movie companion book for a gift and we are starting our own little family movie critic day of the week around Thanksgiving. I can't wait to see what the kids write. Disclaimer: I received a sample for my honest opinion.